Build Your Confidence at Hitch Fit Gym just like Brandi did! 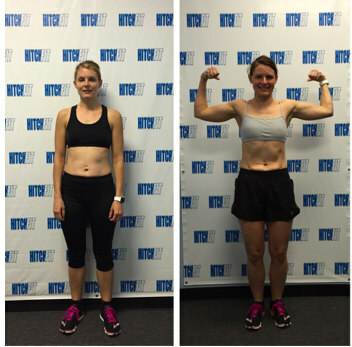 Build Your Confidence with Hitch Fit Personal Training like Brandi did. Tell me about where and why you started your journey. Growing up I was the girl who would pretend sick to get out of gym class. I was not athletic and good eat pretty much anything and not put on weight. When I became pregnant with my first child I looked at it as an excuse to indulge even more. I gained 50 lbs that pregnancy. Two years later with my second pregnancy I had not learned and gained 70 lbs. My 5’4 frame was now topping the scales at 200 lbs. Through clean eating and exercise I was able to lose that weight and consequently fell in love with working out. I maintained my weight for a long time and continued to make progress in my fitness. Fast forward to Graduate School, raising a family and being diagnosed with multiple food allergies including gluten and the weight began to creep back on. I had also suffered two stress fractures during this time and had to give up distance running. It became clear to me I was not able to out-train my diet and I needed help. I had a great HIIT program in place but felt I was lacking in my weight lifting knowledge and capabilities. 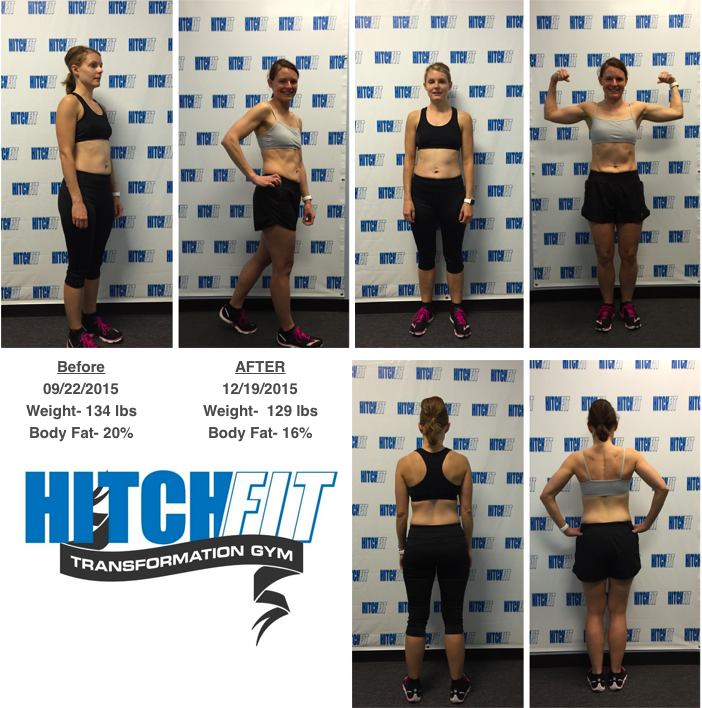 I knew of a teacher at my kiddos school who had completed a transformation through Hitch Fit and she looked amazing! I saw a Groupon and knew I had to try it. I met my would be trainer Kurtis and loved all the science and knowledge he had regarding weight training, diet and exercise in general. I loved it so much I knew the two Groupon sessions were not enough and I signed up the 12 week transformation. Tell me about your transformation. I was encouraged to learn that my initial measurements put me in the athletic category (19.57%), however, I was at the very bottom of the category and knew I was capable of so much more. Like any new program. it is exciting in the beginning and you give it 100% not deviating from the nutrition plan or any other aspects. It is the middle that is the hard part. I did great during Halloween, but then Thanksgiving came I got off track. I had achieved a body fat of 14.14% prior to Thanksgiving but ended my transformation at 15.79%, while I was disappointed in myself, Kurtis was always there telling what a great job I was doing and how it is impossible to be perfect, it is ok to mess up the important part is to get right back on track. I appreciate this support very much and it is what my transformation so meaningful. I knew that if I was having a bad day and ready to raid the candy draw at work, I could message Kurtis and he would be there with encouragement, to talk to me off the ledge, and to remind me of my goals. During my transformation my husband commented several times how great I was looking, I got back into a pair of jeans I had not been able to wear in quite some time, and I had veins popping out my arms in places like never before. I also came away with the confidence to walk into a traditional gym and know how to properly use the equipment and maintain my form. Lastly, I was focusing on the number on the scale that I used to be, I learned to not pay as much attention to the scale and focus more on my gains in the gym and body fat. I have more muscle than I did at that magical number on the scale, therefore, I will likely never be that weight again and that is a good thing. The reason Hitch Fit worked for me is due to the accountability. Therefore, I chose to continue to check in with Kurtis on a monthly basis to track my progress and continue to learn. I want to see that 14.14% body fat again! Mostly, I want to focus on eating clean, and being the best version of me. Is there anything you would like to share with others who may be in the same place you were to help them? I think we women, in general, can find the gym intimidating. No matter your size, no matter your age, Hitch Fit can give you tools to build your confidence, and help you exceed your goals. Don’t wait, everyone always wants to wait till the Monday, or the New Year, start today because Monday will turn into the following Monday and the New Year will turn into next year. You are worth it!